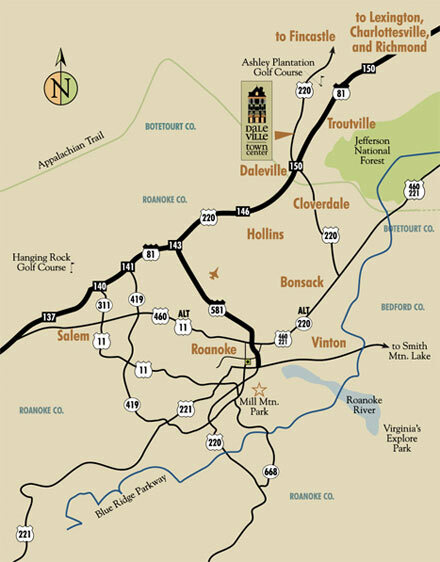 Daleville Town Center, in Botetourt County, VA, is located amidst one of the most breathtakingly scenic areas of the country. Surrounded by the majestic Blue Ridge Mountains, less than 3 miles from the Appalachian Trail. The beauty of this location is also its proximity to urban amenities. With all that peace and quiet, it’s hard to imagine that it’s just a short drive from all the cultural offerings of downtown Roanoke and the Roanoke airport. With conveniences such as coffee shop, gift store, farmer's market and restaurants, you will have everthing you need in your front yard!